Encapsulation of living cells in hydro-gels is a well-known technology used in an increasing number of biomedical and industrial applications, as already seen here. Microencapsulation in alginate beads is an emerging and efficient technology used for the preservation of probiotics against adverse environmental conditions: alginate gel protects bacteria when exposed to acidic conditions and bile salts allowing them to survive and enrich human microbiota. The possible environmental applications are interesting as well: alginate beads can be used as synthetic inoculant carriers, slowly releasing the bacteria into the ground to stimulate plant growth. Furthermore, immobilization in alginate beads provides a protective environment for algae and bacteria involved in wastewater treatment permitting efficient nutrient removal. Monitoring bacteria living status, growth rate and micro-bead characteristics (e.g. dimensions and half-live) in different conditions it is fundamental to further develop these technologies. 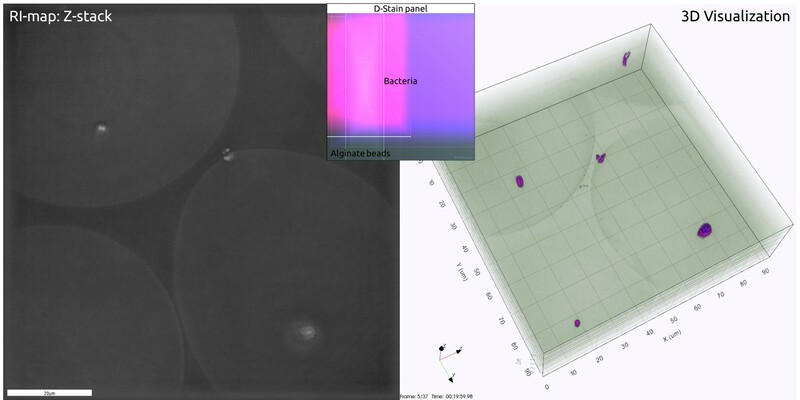 In this blog post we want to show how Nanolive’s technology was able to monitor several E.coli bacteria colonies growing into alginate beads. The 3D Cell Explorer, for the first time, allows you to visualize in 4D multi-layer cells without any chemical staining! Figure 1. E.coli bacteria embedded in alginate beads (generated by Encapsulation Unit – Var J30, 40-70 microns diameter). The beads were mounted on a slide into Minimum Media (MM) diluted 1:4 with distilled water (plus 1% v/v Fumarate 100mM) . The time-lapse imaging experiment was conducted with a standard top-stage incubator set to 37°C and 90% humidity for 3 hours, capturing images every 10 minutes. The volume measure fuction of STEVE (based on the digital staining) allows us to determinate the average bacteria volume and monitor the colony volume increaseing in Real-Time. In this way, it is possible extrapolate the number of bacteria forming the colony and their growth rate. Figure2. E. coli bacteria colony growing overnight (MM medium, 90% humidity, 37°C, no agitation). For the sample granting and the kind permission to reproduce the images on this blog post we thank Diogo Tavares, Manupriyam Dubey and prof. Van Der Meer Jan Roelof (Département de microbiologie fondamentale, UNIL, Lausanne, Switzerland).